Our World of Energy is proud to introduce Alyssa Parr to our website visitors as our Higher Education Contributor. 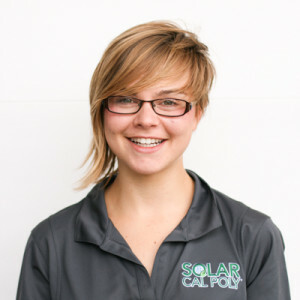 Alyssa is an architecture student and solar energy enthusiast studying at Cal Poly San Luis Obispo and has co-led Solar Cal Poly, a multidisciplinary team designing and constructing INhouse, a net-zero home for the Solar Decathlon 2015. The following is her first guest blog for OWOE, and we hope to be hearing much more from her in the future. As human beings, everything we encounter and experience grows from the sun’s energy. Similar to how plants receive nourishment from the sun through photosynthesis, solar photovoltaic power converts the sun’s direct current (DC) to alternating current (AC) to provide electric energy. Imagine a gathering of thousands of humans — inventors, entrepreneurs, investors, policy-makers, and enthusiasts — in which the ultimate goal is to transition our planet toward clean energy through solar power. September 14th-17th, 2015, I experienced Solar Power International (SPI) from the perspective of an exhibit hall volunteer. SPI is the largest solar conference in the world. This year, the conference was held in Anaheim, CA. September 15th was the opening day of the exhibit hall. Upon arriving for my volunteer shift, the conference founders, non-profit organizations Solar Electric Power Association (SEPA) and Solar Energy Industries Association (SEIA) were ready to go! As soon as I put on my bright orange volunteer t-shirt, I transformed from a curious college student to an assertive young professional, ready to provide direction to conference attendees. I quickly familiarized myself with the location of different solar events going on, picking up a few extra maps and of course noting the free happy hours scheduled into the conference. As I stood at the entrance to exhibit hall C, I had the opportunity to interact with hundreds of people. I consciously kept the spirits of the atmosphere up with my smile a warm “hello”. I watched as those around me entered the exhibit hall curious. Some had a direct plan of business to accomplish while others wandered and let their business unfold as the day progressed. I personally managed my time with a healthy combination of both—volunteering for a four hour shift each day, going back to the hotel at night, and letting the rest of my activities happen serendipitously. By the end of day 1 at the exhibit hall, I had run out of business cards. I handed each of my cards to someone with a different skill set than myself, yet also passionate to devote their creative energy toward advancing the solar industry. In this industry, no matter what your job title is or where you come from, we are all human beings on this little blue planet. At SPI, we treated one another with respect, looked each other in the eye, and grew together with an understanding that it takes all of us to make positive change in the precious environment we share. After Solar Power International, I left with a sense that everything I do from day to day plugs into a greater context. Through the friendships I made, there is a continuation of the momentum from SPI 2015 that I will carry with me forever.